Phil Dawson/WZZMA view of police and fire officials responding to a collision that killed several bicyclists near Kalamazoo, Michigan. 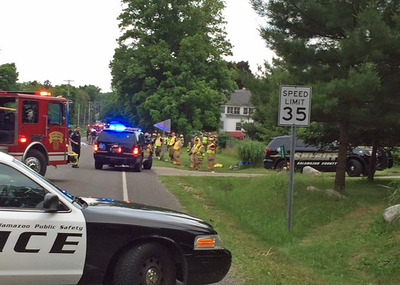 At least five bicyclists were killed Tuesday evening after being struck by a pickup truck north of Kalamazoo, Michigan, several local media outlets reported. Kalamazoo County Undersheriff Paul Matyas told WOOD-TV that at least nine victims were involved, some of whom may be children. It’s not clear whether any of those killed were children. Matyas said the driver fled on foot after the collision, but has since been arrested. Witnesses said the bikes and the truck had been moving in opposite directions at the time of the collision. “I saw a bunch of bikes hit the front of his truck and a couple of them flew,” one witness, Markus Eberhard, told WOOD-TV. According to the National Highway Safety Traffic Administration, 726 cyclists were killed by motor vehicles in the US in 2014.